we will go for second phase of agitation, Non-Cooperation Movement scheduled on 23rd to 26th October with slightly change- CoSAAP. The day long meeting of Confederation of Service Associations of Arunachal Pradesh (CoSAAP), leaders have decided to continue with its democratic movement in support of their demands. 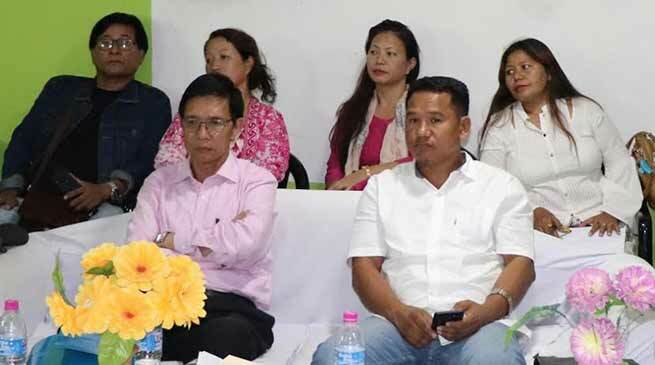 Talking to Arunachal24, CoSAAP President Pate Marik said that the daylong governing body meeting of the several federal units and district units held to review the first phase of Democratic Non-Cooperation Movement of State Govt. employees observed on 11th & 12th October, 2018 and to discuss future course of action of the on-going movement. In regards to the 2nd phase of democratic movement Marik said that we realised the hardships faced by general public, business community and other stake holders due to long holidays, but we will go for second phase of Democratic Non-Cooperation Movement scheduled on 23rd to 26th October with slightly change. On 23rd & 24th October the employees shall attend office/workplaces and discharge their normal duties by wearing black badges as a sign of protest. The HoDs shall direct the employees to arrange black badges and wear. If the State Govt. further fails to redress the grievances till such period, the employees will resume its pen/tools down movement as announced earlier on 25th & 26th October, 2018 and the proposed third phase of Democratic Movement will remain stand. He said that the delegation of the confederation will submit the resolution adopted today to the state government soon. Marik added. The house strongly condemned and opposed the Govt. orders for deduction of one day salary from the employees of few departments which is total injustice and unfair when entire state govt. employees were on democratic movement on 11th and 12th. The house unanimously demanded for its immediate withdrawal. While condemning the statement given by chief minister in a public meeting at Jamiri, and Kalaktang in West Kameng district, threatening to impose “President Rule” in the state to suppress the democratic movement of state govt. employees. Since, the state is not facing any constitutional/law & order break down, thus threatening to impose Article 356 from the Executive head of state is uncalled for.